The town of Shotts stands in an upland location a little to the north of the line of the main A71 road through North Lanarkshire and just over two miles south of the M8 motorway. 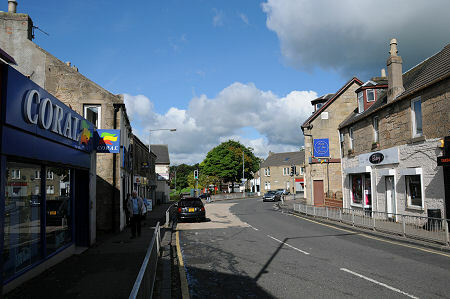 The town comprises several elements, with Shotts and Dykehead lying to the north of the South Calder Water and Stane to its south. The road patterns means that Shotts is bypassed by all major through routes. As a result it is not somewhere visitors find themselves in without making a conscious decision to come here. Perhaps the nearest to a "through route" is the railway that links Shotts to Glasgow and Edinburgh. But if you have the time, Shotts does repay exploration. It is not somewhere even its greatest fan is ever likely to call "pretty", but it is somewhere with a great depth of industrial heritage and an interesting story to tell. The origins of Shotts start a couple of miles north of its present location, where Kirk o' Shotts stands in an imposing location overlooking the M8 motorway, and immediately to the south of the old main road from Glasgow to Edinburgh which was supplanted by the motorway in 1967. The church you see today was built in 1821, though an earlier church founded by Archibald Douglas, 3rd Earl of Douglas, or "Archibald the Grim" stood on the site from the late 1300s. In the years around 1500 the main road through Kirk o' Shotts became notorious as the hunting ground of a highwayman called Bertram de Shotts, reputed to be a 7 foot tall giant of a man. Bertram was so disruptive that a bounty was placed on his head by James IV. This was collected in 1505 by John Gilchrist, Laird of Muirhead who ambushed and killed Shotts. 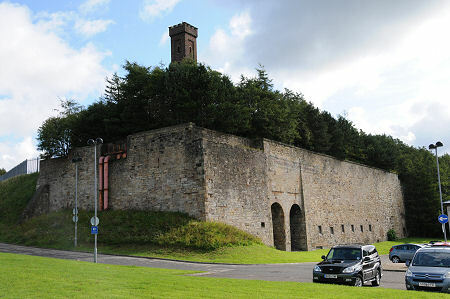 It has been suggested that Bertram de Shotts later gave his name to Shotts, but this does seem no more than folklore: Bertram seems to have taken his name from the place in which he lived and the true origin of "Shotts" appears to be the Gaelic for "place of steep slopes", which well fits the upland location. In 1802 a moorland area two miles south of Kirk o' Shotts and just north of the existing small village of Stane became the location of a major iron works, built to exploit the large reserves of ironstone found in the area. As the location lay in the parish of Shotts, that was the name given to the settlement that grew to service the iron works and the coal mines which rapidly followed. By the later 1800s the works at Shotts had grown to the extent it was using the slogan "Shotts lights the world", as gas lamp standards made here were exported throughout the British Empire and beyond. By the beginning of the 1900s a steelworks had also been established in the town. In the space of a century Shotts had grown from virtually nothing to become a thriving industrial centre. Other services also began to be provided, including, in 1894, the establishment of the imposing Hartwood Hospital as an asylum just to the west of Shotts. Iron and steel production in Shotts ceased in 1947, though part of the works is retained as a reminder of the industry. By this time, however, coal mining had taken over as the area's major employer with some 15 pits in production within a few miles of the town, employing some 5,000 men. Some of these pits had been in production since 1850, though others were sunk during or after World War II. By the early 1950s some of the pits had closed, and the last were gone by the middle of the 1960s: leaving a landscape that still shows signs of the industry half a century later, and a local economy that is still striving to find its place in the modern world. A much more positive reminder of this industrial heritage comes in the form of The House of Edgar Shotts & Dykehead Pipe Band, based in Shotts and 15 times winners of the World Pipe Band Championships. In 1978 a new source of employment arrived with the building of Shotts prison, just to the north west of the town. This has since seen further investment and expansion. Another driver of the local economy is open cast coal mining. This does little for the landscape it directly effects, but when the coal runs out the areas involved are restored, usually to moorland and wetland. One ex-open cast site a few miles south east of Shotts towards Forth has became home to the 42 turbines of the Black Law Windfarm, arguably the third generation of energy production on the site after deep mining and opencast mining.